Following Camille’s lovely entry, a very kind soul gifted me with a decant of this soft fragrance after I expressed intrigue in it. 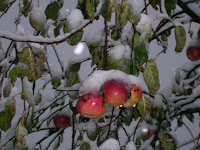 Anything that smells like a “light dusting of snow” or “white paint” would provide a fabulous contrast to my heavy florals, syrup-y sweet gourmands and spicy, dense winter fragrances. Now after experiencing it, I have to agree with Camille’s assessment. As a first snow gently caresses the cold and lonesome ground, dusts large, expansive fir trees and blankets still, frozen waters, so does L’Eau d’Hiver change the landscape of its environment, subtly rendering it more peaceful, calm and beautiful. The notes include bergamot, angelica, iris, honey, hawthorn, jasmine, heliotrope and white musk. What stands out with wear on my skin include herbaceous, fruity angelica, a touch of iris for that cold quality, a teaspoon of honey, a pinch of cheerful heliotrope and lots of comforting, healing white musk. Like all fragrances I have tested from this line, if I were a one scent kind of girl I could call this one my own. Yet, I am not and the sooner I admit that the happier I am. 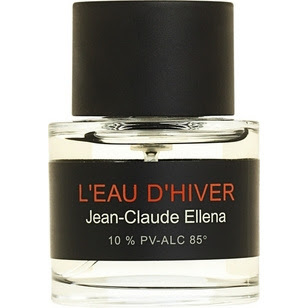 However, each of his fragrances are signature scent-worthy with L’Eau d’Hiver leading the pack for those on the hunt for a pillowy soft, dreamy, unassuming, unobtrusive and coldly comforting fragrance. My only complaint is that my skin does not hold onto it for long. As snow melts with the warming of the sun, it quickly evaporates in response to my chemistry in a matter of hours. However, the few hours that it does linger are enchanting, refreshing and polite. Frederic Malle L'Eau d'Hiver is available at Barney's. A 50ml bottle retails for $115, three 10mL travel sprays sell for $80 and a 250mL splash is $330. Image of bottle courtesy of Barneys, snowy scene courtesy of stonyfields.com.